Jim Valentine is a relatively ordinary man in a relatively ordinary rut. Solitary and unfulfilled, he moves though his life without hardly making a ripple. Then, one day, he meets an interesting old man in the park and everything changes… or maybe it all just stays the same. I wanted to give over some special time to reading Jim Murdoch’s novel ‘The More Things Change’ so I read it as I walked to and from work every day. People I passed regularly remarked on how I did this without running into lamp posts or falling down manholes. It’s all about peripheral vision, I think. It made for a heightened experience, I think, reading the book while moving through streets and parks, passing business people, dogs, and children as I went. The book concerns itself with questions of life and existence and interaction and it was an added dimension to be out in the world and moving through it as these question were addressed. Jim Murdoch is a consummate writer. He knows exactly what he is doing and he does it with great insight, wit, and skill. The corollary is also true. He knows exactly what he is not doing. He is not writing a bodice-ripper nor a page-turner nor a thriller nor a mass audience satisfier. He is a writer with a poetic and an intellectual heart and he has themes which he wishes to probe and to agitate. His book has characters and story and development and resolution – all those things one looks for in a book – but they are not the priority. The priority is exploration, thought and the development of ideas. At first glance, then, the book may present as a weighty tone. Not in actual bulk but rather in a certain delay in story development while thoughts and theme are being explored. First glances can be misleading though because Jim is a writer with a colossal inner database of cultural references, all the way from the sublime to the ridiculous, and this makes for a journey between the covers that is both a funny and constantly enlightening one. Jim and I have things in common. We are both writers who will never stop no matter how little feedback the world chooses to give us. We have writing in our blood and we must do it, in some form or another, to keep that blood flowing. We are also quite different animals too, in our way. In trying to think of a comparison, I came up with a pond. If the world was a pond, then Jim might be a Pike in that world. Strong and imposing, digging deep into the bottom mud and poking hard among the bullrushes to find its fodder. As for me, I think I would be a pond skimmer, fast and precariously-balanced, never stopping to inspect anything too hard for fear of slipping though that surface tension on which I so depend so heavily. The pond skimmer is probably not the best creature to interrogate the ways of the pike. Jim digs deeper than I dig and his tendency to borrow deeply into the mud sometimes makes me a bit nervous and tempted to skim quickly on to the next available water lily. And the water lilies in Jim’s novel are sometimes more widely spaced than the poor pond skimmer can comfortably handle. To be less obtuse, the novel takes its time from development to development and this can require some acclimatisation in this world of never-ending sound bites and gifs. But, after one realises that getting there is much more than half the fun, only then can one start to more fully appreciate what Jim is doing here. He is actually much more like a cat than a pike, a Cat-Pike. He toys with his reader – his dinner – in a most mischievous and calculating way. He pulls himself out of the narrative then pulls himself back in, then he acknowledges that he has done this, then he does it again. Jim knits a deep pile rug for us then gleefully pulls it out from under our feet. What I’m trying to say is that Jim’s writing is not always entirely easy but it is always entirely worth it. Do not think that he pursues a thought as far as he does because he is self-indulgent or in need of editing. One need only look to Jim’s amazing body of poetry work to see that he could literally write the book on being concise and succinct. There are no mistakes here. Jim writes as he chooses to write and he knows exactly what he is about. The book left me sad. I think that is a personal reaction from someone who seems to spend an inordinate amount of time concerning himself with other people. I am someone who sometimes seems to find my own self vanishing in my outward-gazing habits. I know this is not a good thing but, through conditioning and life-experience, it is just how I roll and it is difficult to change. This book seems to be more about the ‘self’. The ‘other people’ in the book seems to me to be quite peripheral and even disposable in the most literal sense of the world. Jim’s closest companion seems lovely and quite perfect but that person comes and goes and hardly ever seems to exist in that person’s own right. The most powerful character in the book seems kind and understanding and benevolent and yet also seems capable of acts of wanton destruction on a whim. To say more would be to spoil the twists and turns of the story. Again, I know that all of this is no accident. Jim is a student of Beckett and, here, he almost seems to ‘out-Beckett Beckett’ in terms of casting a cold eye on life and death. (Yes, I know who that is). The overall result, for me, was not uplifting, nor was it meant to be. ‘Jesus,’ the reader of this review might say, ‘you’re not going to sell too many books for him, are you?’ and no, I’m not. But Jim and I know better than that. We know, all too well, that I could write here that Jim’s novel is a hot bed of sexual intrigue, murder, car chases and political chicanery and I still wouldn’t sell a single book for him. This blog of mine will never persuade anyone to buy anything and Jim and I both know that. All that I can do here is to react to the work I have read and to pay it the compliment of exercising my brain around what I have seen and heard and felt there. I learned from the book that I don’t have to be made happy to be satisfied and I realise that a writing work must contain some considerable power to make me feel as down about things as it did. The book wrought in me a passing but quite real feeling of general hopelessness and despair and, although a review like that on the back cover won’t make you pick it up at the airport and take it on the plane with you, it might make you feel that here is a writer who looks deeply at the world and who can skilfully evoke some of the pain he sometimes sees there. 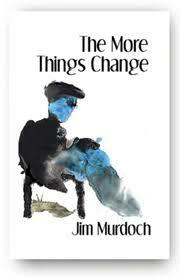 http://www.jimmurdoch.co.uk/books.html#change and, for a full flavour of Jim and the work he does, please do visit his blog at http://jim-murdoch.blogspot.ie It is a monumental work of commitment to writing which I believe may come to be recognised as such in times to come. After I got to the end of the opening section I hit a brick wall. Although I’d started out with one thing in mind I found I didn’t like the idea of repeating myself. And the book lay in a drawer, well, on a hard drive, for a good two years before I got the idea to jump twenty years into the future and ignore his rise to success and the subsequent collapse of his marriage; none of that interested me. Changing to a first person narration was what made all the difference and that’s where writing all those short stories—which is what I’d ended up doing in the interim—helped. The structure’s meant to echo Beckett’s life. His early novels were written in the third person. In the trilogy he moved to a first person narrator and then it was on to the plays which is why the last section’s written the way it is. I didn’t set out to “out-Beckett Beckett” as you put it or even to imitate him especially (except in the funeral urn section which was based on the sucking stones text in Molloy) but I wanted a sense of Beckett to be there. Jim’s universe is built on what was important to him. In an early bio I once referred to myself as “the character Beckett never got round to writing” and that is what Jim is. Most people assume that Act II of Waiting for Godot takes place the next day and it probably does but they also get that if the acts went on forty years later the two of them would still be standing there waiting for Godot. You’re quite right when you called the other people in the book “peripheral and even disposable” because they are. Jim’s dad only exists as and when needed. Only Abby is granted any depth. He can’t even remember his kids’ names in the end and two or three times in the book Jim struggles with names and that’s something Beckett did; the May/Amy thing is straight out of Footfalls, for example. Most of the characters in the novel take their names from Beckett but not Abby. She’s named after a character in Swamp Thing and there’re many nods in the chapter in which she first appears mostly notable the book The Anatomy Lesson which references the first storyline Alan Moore wrote, the one where he reinvented the character. When Len Wein (one of the names on Abby’s keyring) created the character he was a man who’d been turned into a monster. Moore turned all that on its head. He proposed that Swamp Thing only thought he was a man; in reality Alec Holland had died and Swampy only housed his consciousness. No one will make the connection but it’s an important clue for those who do. Londahl, by the way, is an anagram of Holland. I could go on. I want to go on. I will go on! I wanted to write a treasure trove of a novel, a novel you could read over and over again and still discover new things. Christ knows how many times I’ve seen Airplane! and every time I’d catch something I missed on previous viewings. My copy has almost 1500 footnotes because there’s no way I was going to remember all the clever stuff. But the clever stuff came later. I wrote the novel from start to finish and nothing changed from the first draft to the last, nothing essential. It was only once the story was done that I started tweaking it, grafting in interesting things and the more I did that the more I realised there was a whole other level to the book that I’d not seen before, other levels in fact. They were there; they just needed highlighting. I had a religious upbringing as you know but one thing I wasn’t taught was everything’s predestined. In that respect there is no Grand Plan. From a fictional point of view, however, it’s far more interesting if there is a grand plan. And now science is suggesting free will is an illusion and we’re all living in a computer simulation controlled by an evil genius. I love all that stuff and even though I gave up Science at school as quickly as I could it does keep worming its way into my writing. I’m not sure I reference The Matrix anywhere in the novel—it came out in 1999 when I was busy writing short stories—but its spirit is there although Jim is no Neo; Christlike he’s not be but he is godlike and as soon as I realised his initials J.H.Va. were similar to Joe then there was another strand to develop. All writers are gods even fictional ones. It’s odd the book made you miserable when it has a happy ending. Jim’s dream’s fulfilled and I don’t mean the wife or the success—those were red herrings—I mean his real dream. Writers are by their very nature outsiders, watchers (unless you’re Jessica Fletcher) and how many of us yearn to be in the story. Well, that’s what Jim gets. Whether that was something the original Jim wanted we’ll never know for sure. You’re right though any summary of this book will just put readers off. And yet here’s the thing: books like this do sell; there is a market for them. The most recent example I can think of is Satantango by László Krasznahorkai. It’s a miserable book full of miserable characters and yet it’s absolutely compelling. Who’s buying these books? It can’t just be me. One has to wonder how Beckett would fare if he tried to find an agent with The Unnamable today. Would they see it as the work of genius it truly is or would they give up reading the manuscript by the second page? That is assuming they didn’t give up after reading the summary. So I’m not sure what I’m going to do with this. I know it’s good. I’m pretty damn sure it’s the best thing I’ll ever write but no one’s going to read it in its current format. When I first published Living with the Truth back in 2008 I had intended to use the reviews I got as evidence to present to an agent: see, SEE, I can write. But that never happened. Almost ten years on the publishing world’s changed and it’s even harder now but clearly not impossible. As evidenced by A Girl is a Half-formed Thing. I did toy with the idea of sending the book to Galley Beggar Press but I imagine every literary novelist out there’s been banging on their door so maybe wait until the fuss’s died down. In the meantime I just wanted to say thanks for reading the book and for writing this. It does make a difference. I don’t care how sure any one of us is of our own worth/talent/genius it doesn’t hurt to get the odd pat on the back.